Mixing patterns and prints, in interiors, is an easy way to create a unique and interesting scheme, be that in the living room, kitchen, bedroom, or elsewhere. However, it requires a little more design know-how that other decor ideas, if you're going to pull the look off successfully. If you’ve previously retreated to plains rather than risk an unhappy result, be inspired by advice and inspiration for ways to mix pattern and prints in interiors. Looking for more design ideas? Check out our design hub page. If you're working with a space that has high ceilings, consider papering up to the dado rail with one printed wallpaper, then using a second above it. Love a bold wallpaper? 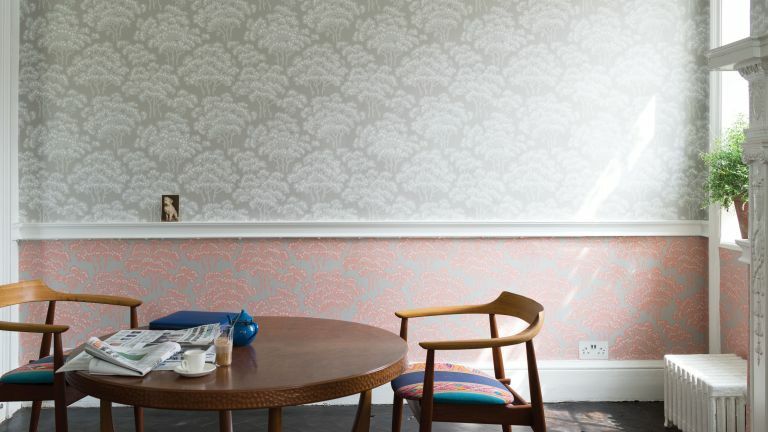 Find more statement wallpaper design ideas in our guide. Moroccan interiors mix patterns and prints with ease, and introducing the typical designs can be a quick route to room scheming success. This look left your considering shutters? Find more advice and inspiration in our guide to how to choose shutters. Don't be afraid of pairing a traditional patterned paper with something more contemporary if you love the idea of incorporating more than one interiors style into your scheme. Like the idea of using grey in your hallway? Find mire inspiration with our grey hallway design ideas. Opting for prints with sinuous lines alongside those with stricter geometry can soften a scheme to suit a room that’s made for relaxing. Teaming beautiful blooms and geometric motifs needn’t be a puzzle. A tops tip for mixing pattern and prints in interior is to look for patterns featuring the same range of colours and they’ll work together a treat. Find more inspiration for your bedroom with our bedroom wallpaper design ideas. Find more inspiration with these traditional living room design ideas. Looking to make a saving on a new sofa? Browse our pick of the best sofa deals. Sized-up pattern can turn a wall into a work of art, but featuring a design that’s this bold doesn’t necessarily mean going plain elsewhere in the room. Like this idea? Browse our pick of the best mural design ideas for more inspiration. Foliage and botanical prints are bang on trend and are an easy examples of how to combine pattern and prints in interiors. Like this idea? Find more beautiful botanical wallpapers in our design guide. Want a room scheme that’s understated but still full of decorative detail? Put together pattern in neutral shades and gentle tints of colour. Wallpapers inspired by traditional prints or printing techniques make a stylish and unique addition to a living room or bedroom. This can be further enhanced by working antique – or antique inspired – artworks into the space. Find this Wisteria Wallpaper by Farrow and Ball at Wallpaper Direct and try a local antiques shop or fair for similar prints. Looking for more design advice?